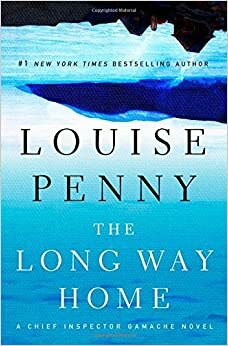 The Long Way Home (Minotaur Books, August 26, 2014) is Louise Penny's tenth Armand Gamache/Three Pines novel and, at this point, regular readers can mentally categorize them. No, it's not that they fit neatly into slots, but along a continuum, where some are weighted more toward the crime-solving end, and others more toward the examination of the soul. The Long Way Home, like The Beautiful Mystery, for example, is one of the latter. After all the intensity and heart-thumping tension and action of the last novel, How the Light Gets In, everyone's due for a little recovery and reflection. And that's just what the newly-retired Armand Gamache is doing, now living with Reine-Marie and the German shepherd, Henri, in a cottage on the green in Three Pines. Gamache has a lot to process, and every morning he sits on a bench on a hillside looking down at the town, reading a slim, leather-bound book. But, each morning, he begins at the beginning and stops at a bookmark before the end. Longtime readers of the series will suspect where that book came from and why Gamache doesn't move on past the bookmark. Gamache's contemplation and retirement are interrupted when Clara Morrow asks for his help. Clara and her husband, Peter, fellow artists, had reached a crisis in their marriage the previous year. They agreed that Peter would leave, but return to their home in Three Pines exactly one year later, to see if their marriage could be saved. But Peter is now weeks late in returning, and Clara has no idea where he is or if he is well. The bonds of friendship compel Gamache to help Clara, teaming up with her, Clara's friend, Myrna, and Gamache's longtime protégé, Jean-Guy Beauvoir. They track Peter along what seems to be a kind of quest, maybe a search for the mythical Tenth Muse, but something that will purge the artistic jealousy that has poisoned his soul and his marriage. "Ergo, he painted them on his return to Canada," said Clara. "Don't tell me you've never wanted to use it," said Clara. "Not now that I hear how it really sounds." So, yes, along with the serious business of tracking down Peter and dealing with some deep emotional damage, we have the usual pleasure of spending time with the people of Three Pines, who by now seem so real that it's hard for me to believe I can't just drive a few hours to southern Québec, just over the Vermont border, and drop into the Bistro in time to have a glass of wine and some of Mr. Béliveau's cheese with them all. This feels like a transitional novel; one that moves Gamache into a new kind of life. So far, Jean-Guy is still part of it, which is good news for longtime readers. Maybe in future books we'll get to see much more of Reine-Marie, something I think many of us have long hoped for. Note: Thanks to the publisher for providing an advance reviewing copy of the book. Versions of this review may appear on Amazon, Goodreads, BookLikes and other reviewing sites under my usernames there.